An International Ice hockey winger, Patrick Kane currently plays for the Chicago Blackhawks in the National Hockey League. He has also played for EHC Biel. He first represented his national team in the 2006 IHF U-18 Championship. 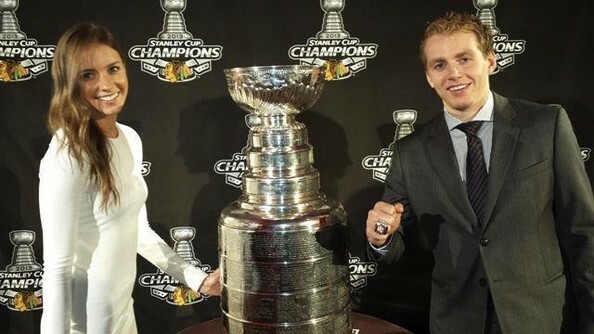 Kane was honored with Hart Memorial Trophy as Most Valuable Player and Art Ross Trophy as scoring champion in the 2015-2016 NHL season. Kane is named as one of the top 15 highest-paid NHL Players at current. As of 2019, he reportedly has an estimated net worth of about $30 million. In 2016, his net worth was estimated to be $12 million. As of 2018, he earns $6.5 million as an annual salary from his current club and has a net worth of $31.5 million. Besides, he makes more than $1 million from his product endorsement. Kane reportedly earned $13.8 million in 2017 as annual salary and made the total earnings of $14.8 million. He made $1 million from his endorsement deals in 2017. Kane bought a condo in Chicago Trump's tower in September 2008 for $2.06 million. He listed his Chicago home on market for sale in July 2016 with the asking price of $2.15 million. Moreover, he also listed his Mansion on Lake Erie for sale $3.2 million which he had bought in 2012. He had paid $2.86 million for the house five years ago. He is the brand ambassador of "Discover" and has made his appearance in its commercial. He has a Hummer car with the price estimated to be about $90,000. Kane is a big heart man who donated $323,000 to the Ronald McDonald House Charities of Chicagoland and Northwest Indiana in 2012. He also participated in the Denis Savard Charity Golf Tournament in 2016. Kane's star sign is “Scorpio”. He was involved in a love affair with his former girlfriend, Jackie Dymora. The couple first hooked up in January 2010, however they separated the same year without citing any reason. Kane then began his relationship with a stunning girl, Amanda Grahovec in 2012. There are rumors that they might get married in the future. It is not clear how the couple exactly met, but there are rumors that they first met at a party in Dallas through a mutual friend. The duo was first spotted in 2013 when Kane won the Stanley Cup. In several interviews, he openly talked about his relationship with Amanda. His girlfriend is now seen in almost all of his games and also appear together at shows and events. He believes in "Spiritualism". Kane and his cousin, James M. Kane were arrested in Buffalo, NYC, on August 9, 2009, after they beat cab driver, Jan Radecki for 20 cents. According to the police reports, the cab fee came out to be $14.80 and they gave him $15 but the driver didn't return them 20 cents and they beat him. According to a driver, he was punched, grabbed by the throat and had his glass broken. In the first, Kane was charged with second-degree robbery, fourth-degree criminal mischief but later he pleaded not guilty and was discharged on August 27, 2009, avoiding any penalties. In the year 2015, The Buffalo News, a daily newspaper reported that Kane was the subject of a sexual assault investigation by police in NYC. Later, Erie County, a county in the U.S. state of New York declined the charged of the press against him because of not sufficiently substantiated by credible evidence. Patrick Kane was born on November 19, 1998, as Patrick Timothy Kane II in Buffalo, New York. He is also known by his nicknames Patty Kane and P. Kane. He was born to his father, Patrick Kane Sr. and mother, Donna Kane and grew up with his sibling, Jacqueline, Jessica, and Erica Kane. Patrick belongs to white ethnicity and holds an American nationality. Kane left the Detroit Country Day School before completing his studies. At his tender age, he met the late Canadian retired NHL player Sylvain Turgeon in Pinnacle along with his father which made him more interested in hockey. At the age of 14, Patrick Kane started ice hockey career, playing for USA Bobcats where he won the title of MVP. He then moved to Michigan and lived along with Retired NHL Player, Pat Verbeek, having convinced to play for the AAA hockey club based in Detroit where he played for three years. Kane was then selected by the junior team of London Knights in the 5th round of the 2004 Ontario Hockey League Midget Draft. However, he didn't play until the 2006-007 season. He was the member of the team that reached the finals of the Ohl's Western Conference where they played against Plymouth Whalers. Kane ended his postseason with 31 points from 16 games, 10 goals and, 21 assists. He was awarded Emms Family Award for the OHL rookie of the 2007 year and was nominated for Red Tilson Trophy which was taken by Travares. Kane signed a three year deal with the Chicago Blackhawks in 2007 as a right-winger. His first match came on June 25, 2007, at Wrigley Field. He later made his NGL debut against Minnesota Wild in October of 2007. After a couple of weeks, he scored his first NHL regulation time goal against Colorado Avalanche’s Goaltender, Jose Theodore. Kane ended his first NHL season with 72 points, making him the top rookie. He was honored with Calder Memorial Trophy after beating Jonathan Toews and Nicklas Backstrom. He achieved his first career hat trick in the plays offs against the Vancouver Canucks in May 2009. After finishing the game, he officially gave his statement to Chicago Sun-Times that, “I am fired up after Willie Mitchell state that Kane couldn’t play five-on-five”. Kane then extended a five-year deal with the team on December 3, 2009, for $31.5 million. He scored winning goal in the Stanley Cup, making him the youngest player in the NHL history which was previously in the name of Bobby Orr in 1970. In 2011 NHL All-Star Game, he was named as an alternate Captain. He got his second career hat-trick against Los Angeles Kings in the 2013 playoffs. Patrick Kane was named as the first winger since Claude Lemieux in 1995, as well as for the first number one overall draft pick since Mario Lemieux in 1992 to win the Conn Smythe Trophy. He missed the remaining of the regular season after he injured left leg in the game against St. Louis Blues through Brenden Morrow. Kane later returned for the post-season and made team highest 20 points from 19 games with eight goals and 12 assists. The team officially revealed that Kane and Jonathan Toews both extended their contract for the next eight years on July 1, 2015, with the yearly salary of $10.5 million. Kane was later named the captain for the 2016 NHL All-Star Game. He crossed his 40-goal mark for the first time in his NHL career after scoring the last goal against Winnipeg Jets. He accomplished first five-point game on January 9, 2018, against Ottawa Senators and was drafted to play in the 2018 NHL All-Star Game. Moreover, Kane is the first NHL player who has been honored with Art Ross Trophy and the Hart Memorial Trophy in 2016. Recently on, January 21, 2018, he collected his 800th NHL career point against New York Islanders at United Center, Chicago, becoming the fifth player in franchise history to reach that milestone. Kane was the member of the team that won OGL All-Rookie Team, OHL First All-Star Team, OHL Rookie of the Year, and World Junior Ice Hockey Championship All-Star Team (2007), First NHL All-Star Team (2009-10,2015-2017) and many others. Firstly, Patrick Kane represented his national team in the U-18 Championship in the 2006 IIHF where he was the highest scorer with 12 points. He made an average of two points per game for United State to led the U.S for Gold Medal in the IIHF World U-18 Championship All-Star team (2006) and earned himself All-Star team honors. Along with the U.S team, Kane competed in the 2008 World Championship and then appeared in the 2010 Olympics Games, Vancouver, where he scored 3 goals and 2 assists from 6 games. He was the member of the team that won the Silver medal in the tournament. He also represented his national side in the 2014 Olympic Games, Sochi where he missed penalty shots over Finland and won a bronze medal.